Today, I will be discussing the stone sizes of diamonds in a round diamond eternity ring. A round diamond eternity band can be made with about any size stone. At deBebians, we can help you design and manufacture any size eternity band. Custom eternity ring with 7.24 cttw of GIA certified round brilliant cut diamonds. We recently manufactured a GIA certified round diamond eternity ring with 0.60 carat for each of the diamonds. This particular ring had only twelve diamonds and the total carat weight was 7.24 carat total weight (cttw). The diameter of each 0.60 point round diamond was approximately 5.3mm to 5.4mm. The biggest concern my client had when we were manufacturing such a big eternity ring was comfort. That is why we manufacture every single round eternity band from scratch. This way, we can control the height of the ring off of the figure for comfort and ensure that the client will love the piece. 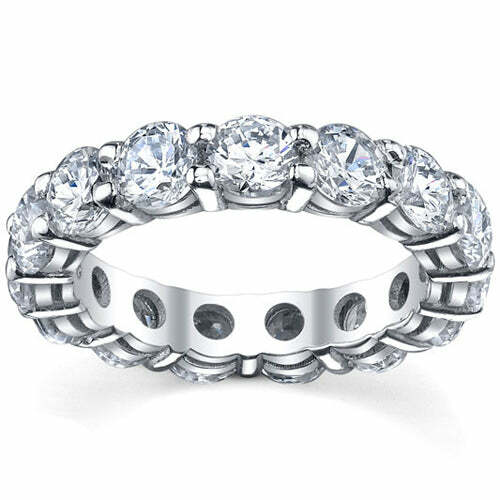 5.00 cttw shared prong eternity ring in style A. 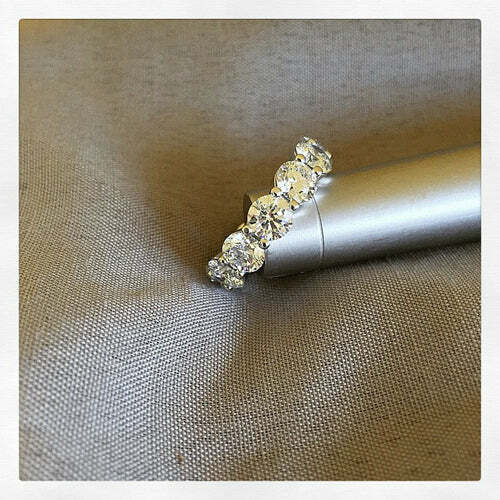 Our largest round diamond eternity band on deBebians.com is a five carat total weight shared prong setting. Obviously, we can manufacture much larger round diamond eternity bands, but we had to stop somewhere. Each diamond in this round eternity ring weighs approximately 0.35 carats. The diameter of each stone in this eternity band is approximately 4.4mm to 4.5mm. This particular ring comes in three different diamond qualities: Good (G/H color and I1 clarity), Better (G/H color and SI clarity), and our Best (F/G color and VS clarity). With the three qualities, you can go for price or quality since the price will range a bit. 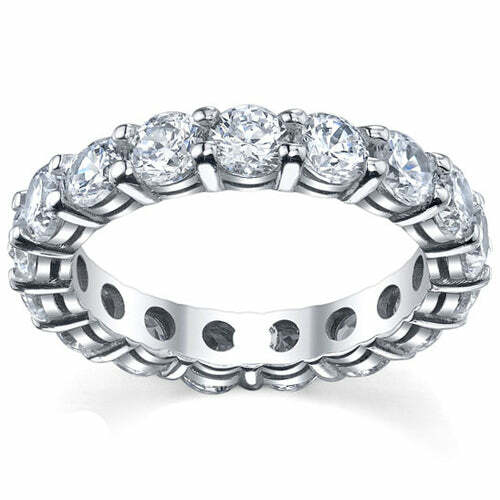 4.00 cttw shared prong diamond eternity ring in style A. Our 4.00 carat total weight traditional shared prong round diamond eternity ring uses approximately 16 diamonds and each diamond weight about 0.25 carats. The diameter of each stone in this eternity band is approximately 4.0mm to 4.1mm. This ring comes in three different diamond qualities: Good (G/H color and I1 clarity), Better (G/H color and SI clarity), and our Best (F/G color and VS clarity). As you can see, we don’t have a round diamond eternity ring with 0.30 carat diamonds on our website. However, that doesn’t mean that we can’t manufacture that particular size diamond eternity ring. It only means that you need to contact our designer to help you design the perfect custom diamond eternity band to fit your style. On our website you will find many more round eternity rings. You can find 3.00cttw, 2.00cttw, 1.25cttw, 1.00cttw and many more.